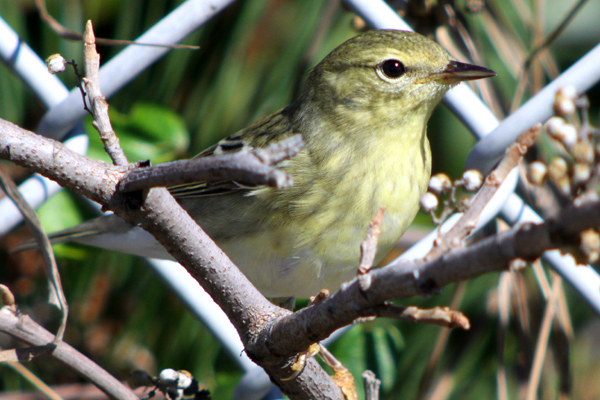 Blackpoll Warblers are one of the species for which the term “confusing fall warbler” was made. Their namesake black cap is entirely lacking by the time they start their epic journey south and they look like just another greenish-yellowish bird. 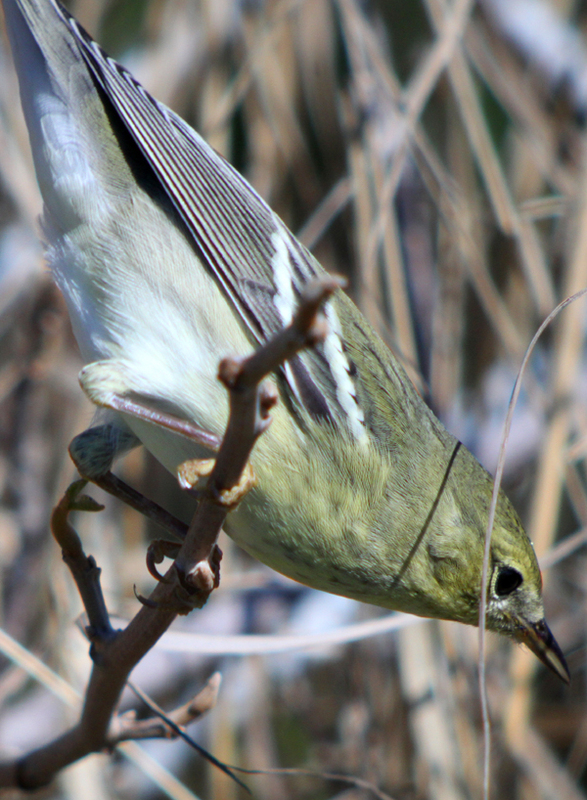 A close examination will reveal the streaking on the back that distinguishes Dendorica striata from the similar Pine Warbler, and faint streaking on the underparts, white undertail coverts, and yellow or orangeish feet and legs that rule out Bay-breasted Warbler. 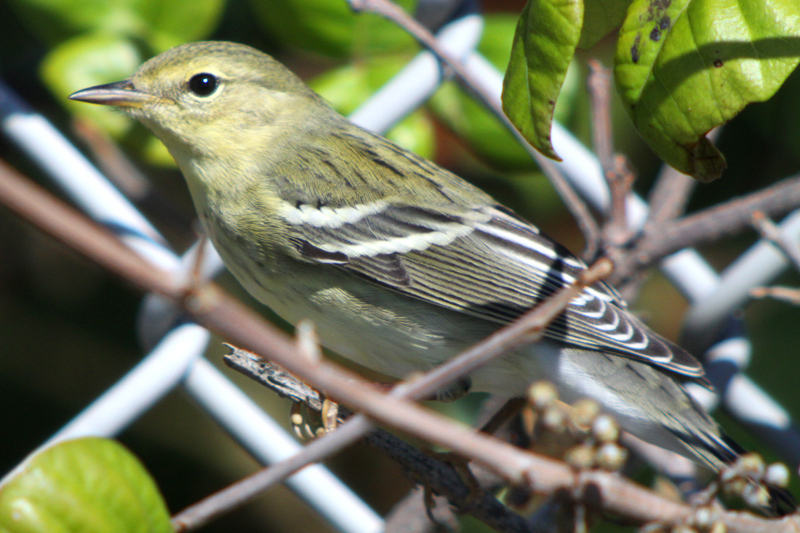 The same day that I got great looks at a cooperative Magnolia Warbler I also managed to spend some time studying and digiscoping a very confiding juvenile Blackpoll Warbler in the same general area. Just the thought that the little five-and-a-half inch bird had already migrated down from the boreal forest of Canada or perhaps one of the mountain ranges of the northeastern United States was mid-blowing enough considering the bird was still in an egg in June. 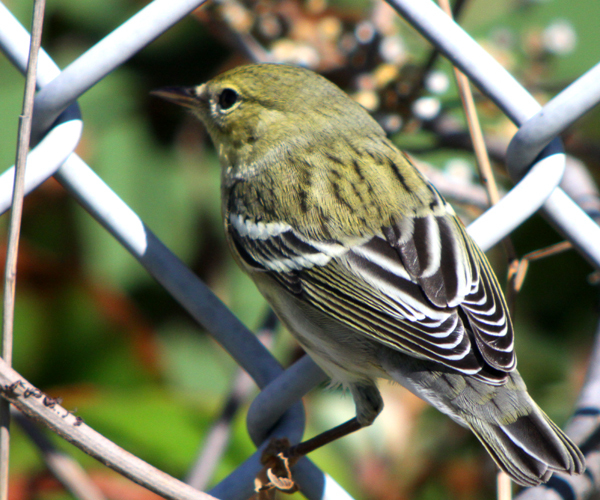 But that is the easy part of the amazing migration of the Blackpoll Warbler. Its next step, once it puts on a lot of weight for energy, is to launch itself southeast out over the Atlantic until it hits prevailing winds that will be at its back as it curves to the southwest into northern South America. The nonstop flight, which take over 72 hours, is awesome in the literal sense in that it inspires awe. Who knows? I might see the same bird when I am birding in Ecuador in November! This post has been submitted to Bird Photography Weekly #109. Go check it out! Beautiful photography! Have pics in Montgomery, NY area? My ancestors–the Lindermans were from there. I love birds. We have a fountain, bird bath, and bird feeders in our back yard. 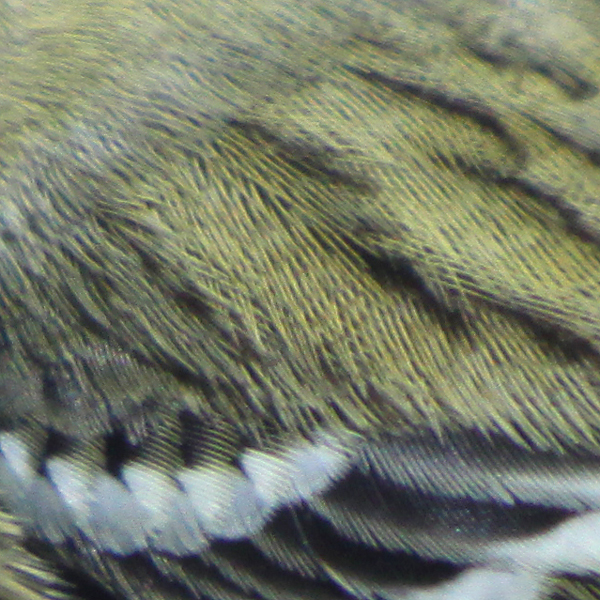 The other amazing thing about Blackpoll Warblers is the way they change their physiology for the migration and that they fly the journey at very high altitudes where there is less oxygen. 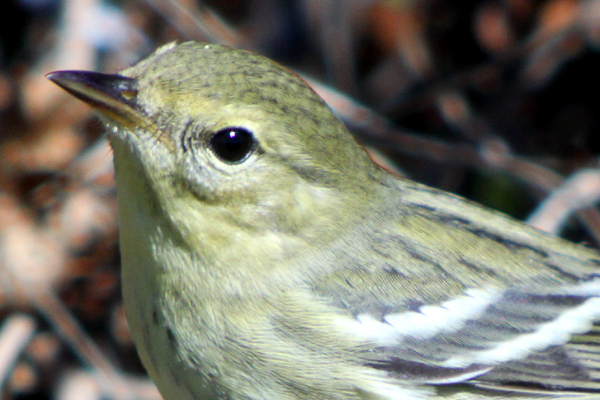 Their ability to withstand the low levels of oxygen available at such altitudes, the blood of blackpoll warblers is characterized by two specialized adaptations. The oxygen-carrying capacity of the blood is enhanced by a high concentration of red blood cells and secondly, instead of one form of hemoglobin in the red blood cells as is typical in non-migrants, they possess two forms of hemoglobin which differ in their oxygen carrying and releasing capacities. This guarantees an adequate oxygen supply over a wide range of altitudes and allows birds to adapt rapidly to varying levels of oxygen availability. Amazing story and beautiful photos!! 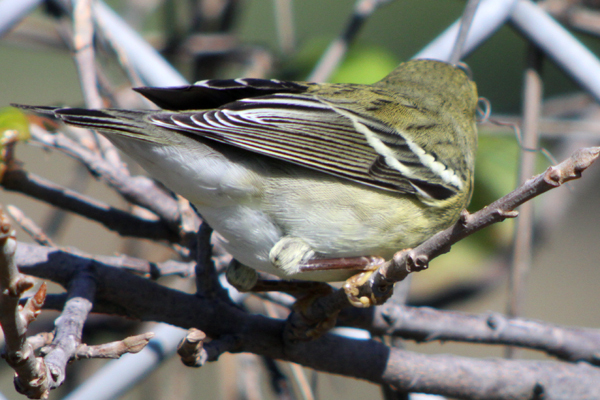 I found the warbler in our bird guide (Birds of Ecuador) so the Blackpoll Warbler flies all the way to Ecuador. In our guide it is shown it in the current plumage as non reproductive and the black-cap plumage as reproductive. The dual hemoglobin adaptation explains how this bird can survive in such extreme conditions, but here in (Ecuador) it can only be found on the eastern jungle of Ecuador, the Amazon. The high altitude flight saves energy since there is less friction and stronger tail winds that help him on his journey. Pilots like Charlie would know the energy savings of higher altitude and strong tail wind. 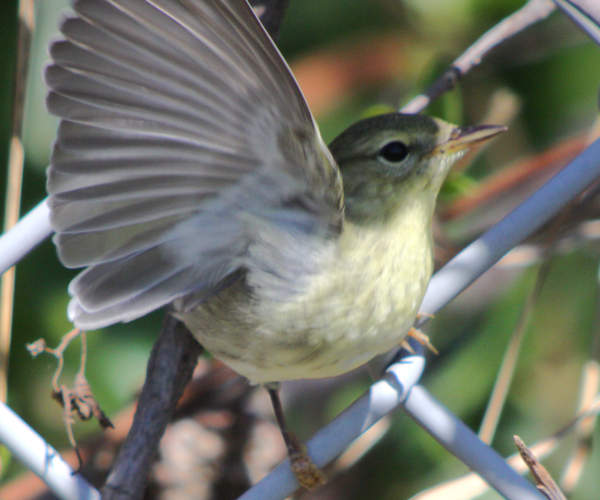 But I think I’ll go one calling warblers ‘pretty little birds’. It’s their legs. That’s why they rock so hard – can’t beat their leg colouration. Gorgeous shots of this amazing bird Corey! The close up of the bird’s mantle feathers is really cool and I love the last “goodbye” wave shot. One thing I enjoy about bird blogging is that I learn new stuff about birds every day. 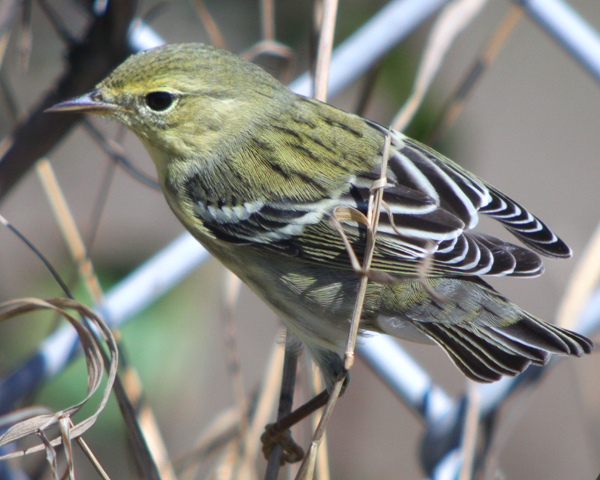 Great information on the Blackpoll Warbler and thanks to Craig for the additional info on the blood. @Craig: Thanks for the info – I had not known that. @Renato: We’ll just have to find other boreal migrants.